Grete is a Nord bard who only appears as the musician during the party at the start of the quest Diplomatic Immunity if the first choice bard, Illdi, is dead. She wears clothes, a pair of boots and does not carry anything else. 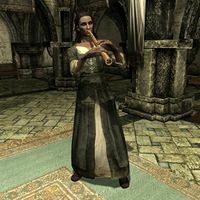 During the party, she will be found inside of the Thalmor Embassy, playing instrumental music for the guests. She seems to enjoy herself and will happily tell you: "I hope you're enjoying the music, sir/ma'am." She will also tell you about the benefits of playing at Thalmor parties: "These parties are a great way to earn a little extra money. ", "It's good practice. Most people barely notice what I'm playing." While all the aforementioned lines are shared with Illdi, she also has one unique line when she tells you about her big dream: "I hope to get into the Bards College one day." Once the quest is over, she will be removed from the game. This page was last modified on 11 January 2018, at 20:51.